Bend Brush applies bending effects to a specified object. It makes objects rotate around the specified central point and bend at the same time. With this brush you can make flowers follow the sun, animate swings, or enliven branches and leaves on a tree. Bend Brush is equally good at animating living characters. Add hand gestures and nods to knights and ladies, or make a huge dragon hover frighteningly above – all of this is possible with Bend Brush. 1. 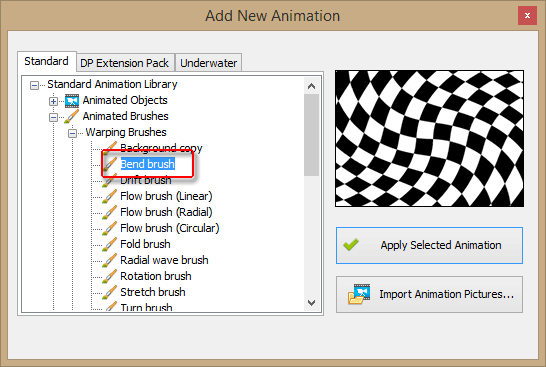 Select Bend Brush from the Add New Animation dialog. The brush is located under the “Animated Brushes” section in the “Warping Brushes” subsection. 2. Click “Apply Selected Animation”. This adds Bend Brush to the list of Animations on the right. 3. Using Bend Brush, paint over the area you want to bend and then adjust the parameters (see below) to make the animation fit the picture. “Soft” - corresponds to gradual change of the bend angle, similar to a pendulum. Good for soft, smooth motions of living creatures or vegetation. “Sharp” - is more like bouncing from one end to another, like a pool ball bounces back and forth. The sharp bending is more peculiar to mechanisms. “Random” – this option makes the object bend randomly, or chaotically. Such an effect can be seen in elemental forces such as tree leaves trembling in the wind, or a randomly flickering fire. “Constant CW” – if selected, the object bends clockwise according to the specified settings. “Constant CCW” – the same effect but for counterclockwise direction. 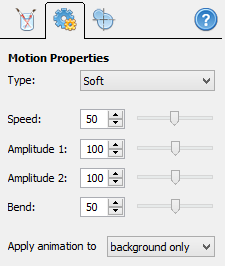 Speed – similar to other effects, this parameter simply determines how fast the bending animation should be. Amplitude 1 and 2 – these two parameters determine the maximal rotation angle when bending clockwise and counterclockwise respectively. Bend – this parameter adjusts the way the object bends. The higher the value is, the more the object distorts and bends. Zero bend means the object simply rotates around the central point, and no distortions to the geometry of the object are made. This tab allows you to specify the central point of the bending. It is around this point that the object rotates and bends. For instance, if you want to make a horse’s head nod, the central point should be set to the animal’s neck. If you animate a flower, the effect center should be placed on the stem. You can drag-n-drop the crosshair with the mouse, or specify the exact coordinates manually.